Let’s say you’re in a restaurant and you’re ready to order. The verb you need is very simple: to have. If you want a burger and a coke, you’ll just say, “I will have a burger and a coke”. I’ll have a burger and a coke. Now, let’s say, your friend wants a Heineken. So he says, “I’ll have a Heineken.” You want a Heineken, too. What will you say to the waiter? There’re several ways. Let’s use the word “same”. I’ll have the same, please. You can also say, “The same for me, please.” But the shortest one would be “same here”. Same here. Now, you don’t have to use the word “same” to say you want the same thing. Just say, “make it two”. You friend says, “I’ll have a Heineken” and you’ll say “Make it two, please.” In five minutes, you’ll both have a Heineken. Cheers! I’ll have a burger and a coke. sameを使わずに「同じものをください」を表現することもできます。この場合は “Make it two, please” と言います。お友だちの注文。I’ll have a Heineken. 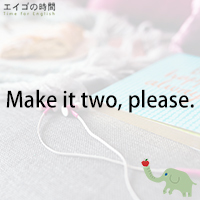 「僕はハイネケンにする」 あなたの注文。Make it two, please. 「じゃ、僕もおなじので」 5分もすれば2人でハイネケンを飲んでいることでしょう。乾杯!